Davao City Volunteer Auxiliary Police Recruitment 2017 - Exam News, Reviewer, Military Career, & Everything [MN] . .
Davao City, Philippines - The city government of Davao and Davao City Police Officer (DCPO) is now recruiting Volunteer Police Auxiliary. Members of the auxiliary program will undergo basic law enforcement, hand-to-hand combat, traffic management and control and disaster preparedness. Qualified Volunteer Policy Auxiliary will be under the Public Safety and Security Program of City Mayor of Davao City dudded OPLAN: IRON City (Integrated and Reinvigorate Operation of the Neighborhood Watch) of the Mega Davao which is an Enhance Police Integrated Patrol System. Processing of interested volunteer applicants is now on going in all Davao City Police Station. 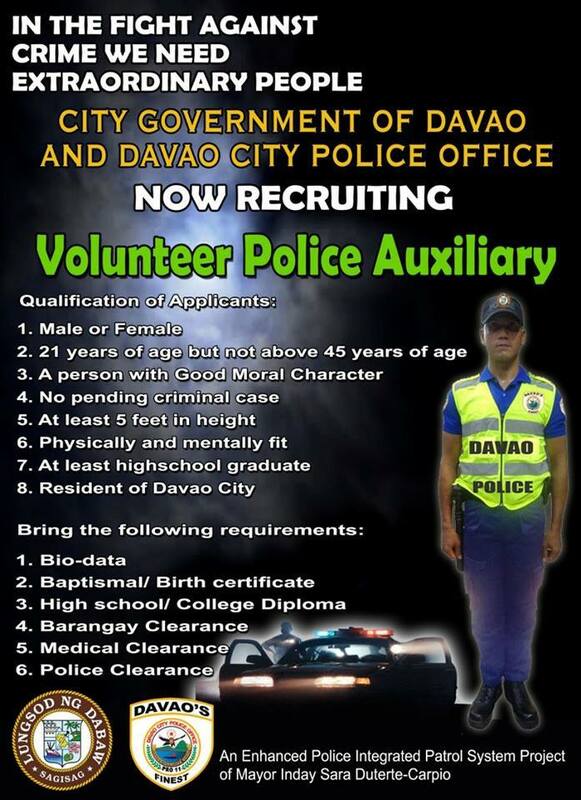 For further information, applicants are advised to proceed to the nearest Davao City Police Station.